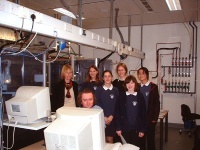 In October, Lynn Nickerson (Science Club Coordinator at Didcot Girls School) arranged for a small group to visit Chemical Crystallography in Oxford University’s new Chemistry Research Laboratory (Figure 1). The group was invited to bring some samples of common crystalline materials with them. 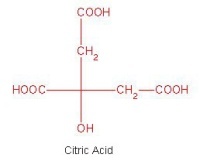 The samples brought included cane sugar and citric acid (Figure 2). The girls used a polarising microscope to examine the crystals, and in the end selected an excellent crystal of citric acid for X-ray crystal structure determination. The crystal measured about 0.2 x 0.2 x 0.2 mm, and had to be ‘picked up’ on a fine nylon filament loop using a film of perfluoropolyether to hold it in place (Figure 3). The sample was put onto the Nonius kCCD automated diffractometer, cooled to -120°C and an X-ray diffraction image recorded (Figure 4). 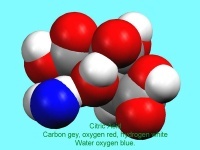 Dr Andrew Cowley collected a full data set in 40 minutes, which was processed by the Oxford crystallographic software CRYSTALS to reveal the structure of the acid (Figure 5 & 6). 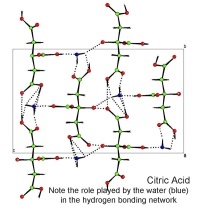 The hydrogen bonding network which holds the crystal together includes water of crystallisation, and is shown in Figure 7. 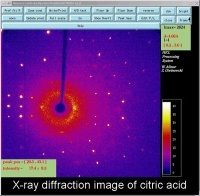 Figure 4: An X-ray diffraction image of citric acid The bright spots are Bragg reflections. 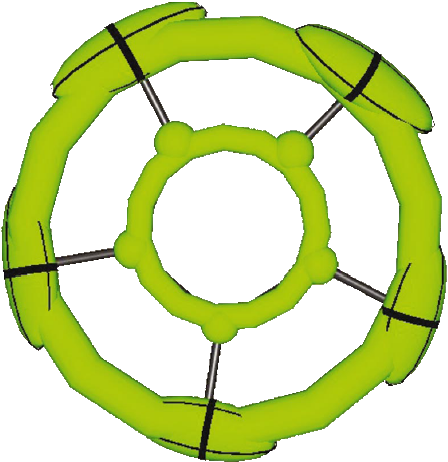 The crystallographically determined bond length, valence angle, and torsion angle information in the Cambridge Structural Database (CSD) has been made accessible by development of a new program (Mogul) for automated retrieval of molecular geometry data from the CSD. The program uses a system of keys to encode the chemical environments of fragments (bonds, valence angles, and acyclic torsions) from CSD structures. Fragments with identical keys are deemed to be chemically identical and are grouped together, and the distribution of the appropriate geometrical parameter (bond length, valence angle, or torsion angle) is computed and stored. Validation experiments indicate that, with rare exceptions, search results afford precise and unbiased estimates of molecular geometrical preferences. Such estimates may be used, for example, to validate the geometries of libraries of modeled molecules or of newly determined crystal structures or to assist structure solution from low-resolution (e.g. powder diffraction) X-ray data. Lecture on the uses of crystallography during Part-II research year. β-U4O9 is a superlattice structure based on the fluorite arrangement of UO2. The U atoms occupy positions close to those in UO2 and the additional O atoms are accommodated in cuboctahedral clusters of -43m symmetry, which are centred on the special 12-fold sites of the cubic space group I43d. The structure has been refined from single-crystal neutron data in accordance with the procedure described in the previous paper [Popa & Willis (2004). Acta Cryst. A60, 318-321]. The program CRYSTALS [Betteridge, Carruthers, Cooper, Prout & Watkin (2003). J. Appl. Cryst. 36, 1487] has been extended to include an option for the refinement of a continuous electron density distribution lying along a line, a ring or on the surface of a sphere. 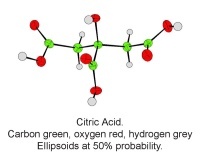 These additional non-atomic electron distributions can be refined in any combination with traditional anisotropically distributed spherical atoms, including the refinement of `partial’ atoms overlapping with the special electron distributions.